At NYU Stern we believe in the tremendous potential of individuals to use business to solve global problems. Our vision is to develop people and ideas that transform 21st century challenges into opportunities to create value for business and society. An Education in Possible is our promise to deliver an education that combines rigor in the classroom with engagement beyond the classroom to broaden perspectives. We fulfill our promise through four core values, Academic Excellence, IQ + EQ, Collaborative Community and The Energy of a Global Hub, in our undergraduate, graduate and Executive Education programs. Admission to Stern is extremely competitive. The school reports that "admissions decisions are influenced by academic achievements and potential, professional/career progression, demonstrated potential for leadership, clearly articulated goals for pursuing an MBA, community involvement and engagement, strong communication and interpersonal skills, letters of recommendation and the admissions interview." 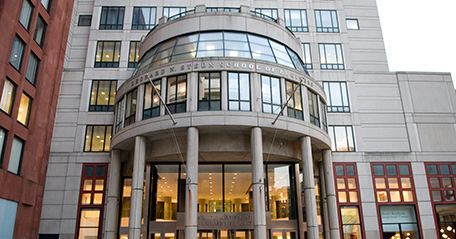 In its efforts to increase enrollment of underrepresented students, "NYU Stern strategically partners with a number of organizations that are committed to diversity…In partnership with these organizations, NYU Stern hosts workshops and recruiting events that educate prospective students about MBA programs and provide assistance navigating the admissions process. Additionally, NYU Stern participates in a number of diversity fellowship programs and summer "boot camps" offered by leading firms in financial services, consulting and marketing." Thanks to its stellar reputation, wide-ranging career-development opportunities, and aggressive campus recruitment programs, Stern boasts an impressive track record for plac­ing MBA candidates in prestigious, high-paying positions. Through the Office of Career Development, students have access to myriad services, from career panels to résumé reviews, as well as industry-specific training. The school maintains deep ties with many companies and “incredible access to recruiters”; plus, the “location in the heart of New York makes networking with alumni and companies all the easier.” With so much in their favor, Stern graduates hit the ground running—in fact, most have made major strides long before graduation day. A current student enthuses, “With no finance experience, I have already secured my summer internship offer at a top investment bank.”In recent years, the following companies hired multiple Stern graduates: Accenture, Bain & Company, Booz & Company, IBM Consulting, PricewaterhouseCoopers, McKinsey & Company, Colgate-Palmolive, Estée Lauder, Kraft, L’Oréal, PepsiCo, Disney, Google, Sony, Yahoo!, JPMorgan, Citi, Goldman Sachs, Credit Suisse, Deutsche Bank, Barclays Capital, Morgan Stanley, Amazon.com, Bayer Healthcare, and UBS. The class of 2012 had a salary range of $50,000-$160,000, with an average base salary of over $107,000 (the average signing bonus was an additional $32,000). Impressively, more than 87 percent of the class found their position through on-campus recruiting and interviews, or other Stern-supported pro¬fessional development activities. Berkley Center for Entrepreneurship and Innovation; Center for Business Analytics; Center for Global Economy and Business; Center for Real Estate Finance Research; Center for Measurable Marketing; Glucksman Institute for Research in Securities Markets; New York University Pollack Center For Law and Business; Salomon Center for the Study of Financial Institutions; Urbanization Project; Vincent C. Ross Institute of Accounting Research and Volatility Institute. Leonard Stern - Chairman and Chief Executive Officer, The Hartz Group, Inc.
Robert Greifeld - President & Chief Executive Officer, NASDAQ-OMX Stock Market, Inc.
John Paulson - Paulson & Co., Inc.
Want more info about New York University, Stern School of Business Executive MBA? Get free advice from education experts and Noodle community members. What school is better for someone who wants to go into Finance, NYU Stern or Chicago Booth? There's not a bad choice here! Both Booth and Stern, as you know, offer extraordinary opportunities to students interested in finance (not to mention many other fields).